We no longer recommend the app because it has become very unstable in recent updates. 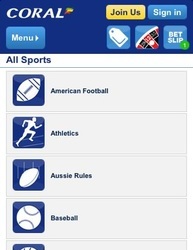 The best UK focused sports betting app is the one offered by PaddyPower. Coral works on Android, iPhone, iPad, Blackberry, Windows Phone. 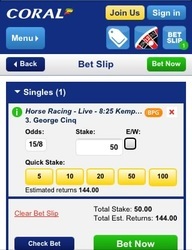 Receive a free £50 horse racing or sports bet when you create an account. Watch live video of horse racing and greyhound racing on your phone. Coral is an online bookmaker based in the United Kingdom that has over 90 years of history in the betting industry. Started in 1926, Coral has made its way from the streets of England to internet betting marketplace. 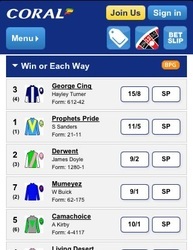 Coral’s mobile betting app is available on Android, iPhone and iPad, Blackberry and other devices. Basically, it works on any device that has an internet connection and a web browser. The Gala Coral Group is a privately owned by private equity firms, Candover Investments, Cinven, and Permira. The company has a large base of operations in the UK, including offices in London and Nottingham along with 600 betting shops. However, a large part of the business is now based in Gibraltar, a popular destination for many online bookmakers. The company is licensed by the Government of Gibraltar and regulated by the Gibraltar Gambling Commissioner. Coral offers a large list of betting options including, an online casino, poker room, bingo and lottery. However, only online poker and casino gambling is available via the mobile application. 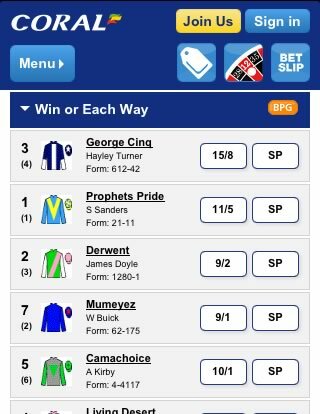 The Coral mobile app will surely meet the needs of every punter on the go, but the company has also thrown in some extra features to enhance the effectiveness of their app. 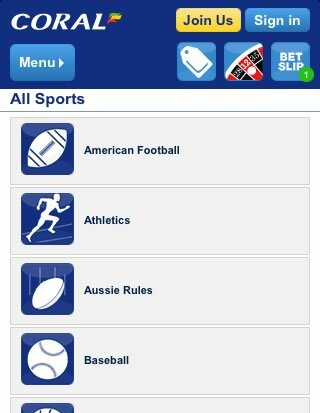 Live betting and the full list of available events are easily accessible from the application, along with live scoring and statistics. 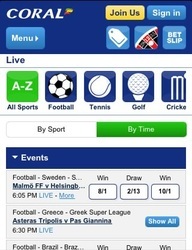 Live betting odds are updated instantly and bettors will be able access the in-play betting feature within the app. Punters will have instant access to their account, deposits and withdrawals, pending bets and account history. 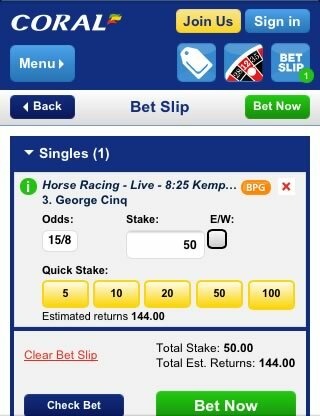 Punters will be able stream a large number of UK based horse races directly from the mobile application and bettors will get a “Best Price Guarantee” on their racing odds and be eligible for many other promotions. The mobile app is adapted from Coral's main webpage's Chartwell software, and the mobile betting software is powered by one of the top gambling software providers in the industry, Playtech. The color scheme is a blue and white, the same as Coral.com and the similarities do not stop there. The buttons, icons and layout on the mobile product are similar as well, so bettors familiar with the platform will easily be able to jump right in. 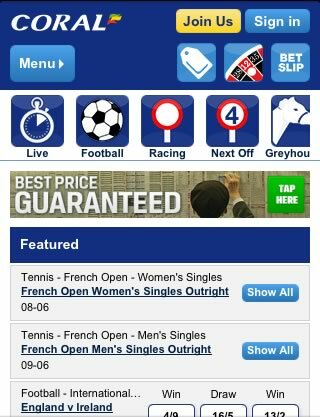 The most popular markets are listed on the main page, which mostly include football, cricket, rugby and horse racing. Also, live betting or in-play betting markets are prominently featured. Placing a bet is a simple process and punters should have no issues quickly finding their betting market and placing a wager. Not only that, but the app is sleek and professional, appears to be bug free and is quick and smooth, as well. Coral focuses on UK and Irish markets but has a massive list of betting markets for almost every sport in the world. Football, horse & greyhound racing, tennis, cricket and rugby are their most popular markets and that is where Coral has the most betting options for punters. 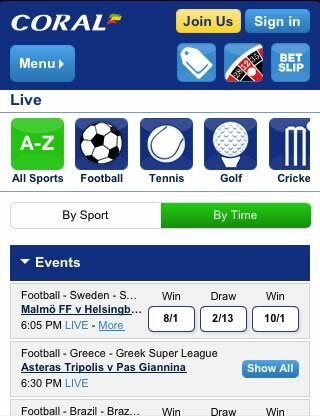 They also offer an extensive live betting menu for players, which as we mentioned above is available via the mobile app. The bookmaker also has one of the most extensive non-sports betting options. Punters can wager on a variety of specialized markets, including music and TV specials to betting on political events and the Royal Family. Customers can even wager on upcoming weather conditions on prominent days throughout the year, such as if England will get snow on Christmas. Coral offers one of the best welcome bonuses for new customers. New punters can get a free bet up to £50 when they open a new account. The free bet promotion is available to be used on any betting market once players fund their account and it applies to their first bet of £50 or less. Coral’s mobile application as a specific button for promotions, making it easy for bettors to find the best promos for Coral and the day’s top matches. In some cases, they are even specialized to your own personal account based on your betting history. This is an excellent feature and one that more bookmakers should take notes on. Coral’s promotions change every few days, so there is always a new way for punters to get an extra edge on a bet or earn some money back via their extensive list of promotions. Bettors would be hard pressed to find a bookmaker with a longer, more successful history than Coral. Truly pioneers of the bookmaking industry, here they are decades later, still in the game with one of the most polished mobile betting applications in the business. Not only that, their massive list of betting markets, best price promotions and welcome free bet bonus vault Coral into the upper echelon of online bookmakers. When it comes down to the total package, few bookies come close to matching Coral.